for the homeless parts within another person. Remen, a psycho-oncologist, is the author of Kitchen Table Wisdom: Stories That Heal (Riverhead Books, 1996), My Grandfather's Blessings (Riverhead Books, 2000), and The Little Book of Kitchen Table Wisdom (Riverhead Trade, 2007), all of which I have read and recommend. She also has written The Will to Live and Other Mysteries (Sounds True, 2001), available as an audiobook. Words are a preoccupation with this week's new edition of Saturday Sharing. ✦ A comprehensive digital archive of poetry readings, the sound archive Oregon Poetic Voices is a wonderful resource. The long list of Oregon poets whose work may be heard online affords many wonderful moments for your listening pleasure. ✦ If you missed my tweet on this, here's the demo for the Kindlegraph, technology that allows an e-book author to e-sign his or her book. This may be the cliched wave of the future but it doesn't do much for removing the growing barriers between writers and their readers. ✦ Utah State University's Western Literature Association has created Syllabus Exchange, a marvelous resource for teachers of western American literature and culture. Syllabi are organized as graduate, undergraduate, and introductory courses, by genre and subject, and by region and state. They're fun to browse, just to see what you might have missed in your own education. ✦ Indulge your interest in rare books at Between the Covers. As one of the taglines reads, "We're not just your usual bunch of book geeks." Need an example? The site features images of books that rotate in 3-D, so you may see front, back, and spine, and even zoom in. ✦ The weekly literary blog AboutAWord publishes original short essays by contemporary writers, including Aimee Nezhukumatathil, Annie Finch, Terrance Hayes, Douglas Kearney, and Matthew Zapruder. Next month the blog begins publishing "micro interviews" with writers. ✦ Writers, scientists, science editors, journalism and MFA students, and graduate, post-doctoral, and faculty researchers have formed NeuWrite as a forum for collaborative work and individual projects. Browse the lists of members and publications to get an idea of who's involved and what they're doing. The group, dedicated to public dissemination of science, is supported by Columbia University's Office of Graduate Affairs. ✦ The secular and fascinating Art Monastery Project is an international community of artists committed to monastic living as applied to the creative process; each member follows the path of an Art Monk in exploring how spirituality, creativity, and integrity combine to create a holistic way of life. The video below introduces the project, which came to my attention via Christine Valters Paintner at Abbey of the Arts, who recently was interviewed by the Nathan Rosquist, a monastery member, about her book The Artist's Rule: Nurturing Your Creative Soul With Monastic Wisdom. My thanks to Christine. ✦ Video artist Bill Viola is the recipient of the prestigious Japan Art Association's Praemium Imperiale award for painting (the ceremony for this lifetime achievement award is this October). Currently, Viola is working on two altarpieces, or "video chapels", on the themes of Mary and the martyrs, commissioned by London's St. Paul's Cathedral and expected to be completed in 2012. The permanent work will comprise two 65-inch multi-screen video installations, with the screens mounted on hinged panels that can be closed during services. ✦ Some 80 artists, designers, writers, musicians, performers, and other creatives in the United Kingdom have created a network known as InterfaceArtsGraduates. The collaborative group (its members are just a few years out of college) meets monthly to "pray and think through a biblical worldview for the arts and creative culture." The network's events include seminars and discussions on such topics as art and relationships and the intersection of art, faith, and professional practice. ✦ Recently, I stumbled upon the documentary Emile Norman: By His Own Design and, curious, took a moment to look up his work. Norman (1918-2009), a successful commercial artist in New York City in the 1940s and 1950s, was largely self-taught and deeply inspired by nature, crafting imaginative and intricate wood inlay panels and sculptures of animals using glass and composites, such as plastics and epoxy resin. He also worked in stone, bronze, and marble, as well as oils, and incorporated in his work leaves, shells, rocks, and other natural materials. His largest work, which he described as a "difficult commission", was for the California Masonic Memorial Temple in San Francisco (see video immediately below); he created a full-color model before beginning the work, each finished panel measuring 8'x6' and weighing approxiately 150 pounds. He was meticulous about its design and execution. Watch the full episode. See more The Arts. Calling his work "my reason for being here", Norman, who built by hand with his partner Brooks Clement an extraordinary home in California that overlooks the Pacific Ocean and Santa Lucia Mountains, had a gallery in Carmel. Many of his techniques and artworks were captured in still photos and on film. He was a marvelous artist. See also: A Visit to Emile's, Working with Nature, Creation of a Mural (a commission for Bank of California [Union Bank] depicting San Francisco's history in wood inlay; this video is archival footage of the artist at work on the mural), A Closer Look (360-degree views of some of Norman's beautiful sculptures), and Inventing a Technique (he demonstrates his use of the "lost wax" technique and of epoxy, which he mixed with sawdust). Each of the videos is well worth your viewing time. 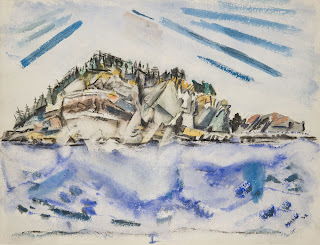 ✭ In Maine, Portland Museum of Art is showing through October 10 "John Marin: Modernism at Midcentury", an exhibition of 54 works, including watercolors, sketches, and oil paintings from 1933 to 1953. ✭ Native American weavings and jewelry from Ohio University's Kennedy Museum of Art are on show through October 30 at the Huntington Museum of Art, Huntington, West Virginia. The exhibition features a selection of 40 weavings and approximately 45 jewelry pieces drawn from the Edwin L. and Ruth E. Kennedy Southwest Native American Collection, numbering more than 700 textiles and more than 2,400 jewelry items of Navajo, Hopi, and Zuni origin. The weavings and jewelry are both historic and contemporary. ✭ Fort Worth's Kimbell Art Museum is presenting "Picasso and Braque: The Cubist Experiment, 1910-1912", through August 21. An international loan, the exhibition of 16 paintings and 20 etchings and drypoints focuses exclusively on two highly productive years in the artists' careers. A catalogue accompanies the show. In addition, an iPad app, iCubist, has been created for the show, which will travel to Santa Barbara Museum of Art in September. ✭ In Santa Barbara, California, Santa Barbara Museum of Art has mounted "Ori Gersht: Lost in Time", on view through September 4. The first solo museum exhibition of the Israeli-born artist's work in the western United States, and accompanied by his first museum catalogue published here, the show brings together Gersht's trilogy of films (Pomegranate, Big Bang II, and Falling Bird) and related work based on European still lifes of the 17th, 18th, and 19th centuries, in addition to two new series based on Japanese history. 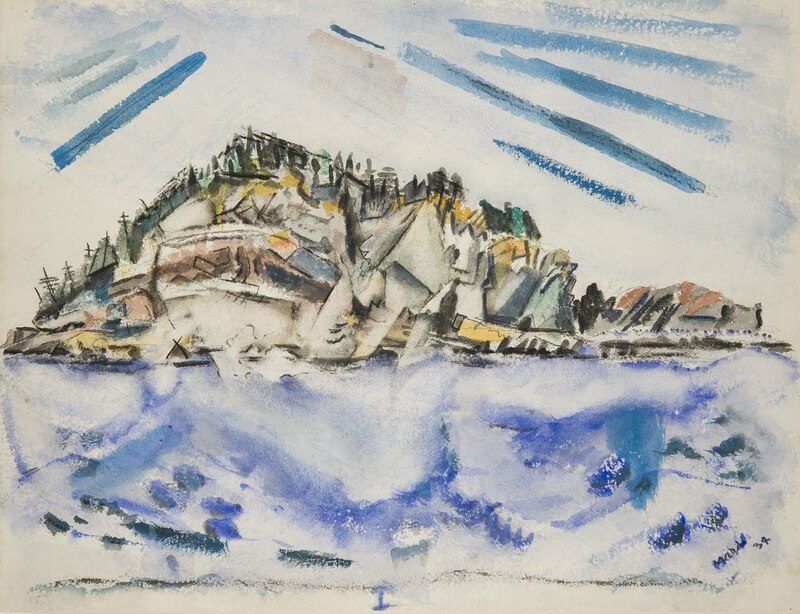 ✭ Work by Milwaukee's "first couple of painting", Ruth Grotenrath (1912-1988) and Schomer Lichtner (1905-2006) is on view until August 7 at Marquette University's Haggerty Museum of Art. See the slideshow here. Grotenrath is known for her still lifes; Lichtner, for his ballarinas and whimsical Wisconsin cows. Both artists were muralists involved in Federal Works Progress Administration art programs during the 1930s and 1940s. Visual artist Maya Freelon Asante (b. 1982) comes from a family of artists (her father is an architect, her mother a jazz vocalist; her great-grandfather was a painter). A graduate of the School of the Museum of Fine Arts in Boston, she has exhibited internationally and is the recipient of fellowships and residencies around the world. I learned of Asante through the documentary below, which traces the inspiration for and creation and installation of her delightful work Ubuntu. The vividly colorful "tissue quilt" is both collage and sculpture; it was selected for the State Department's Art in Embassies Program. Before finding its permanent home in Antananarvio, Madagascar, the artwork was exhibited in Maine, New York, North Carolina, and California, as well as Ghana and other nations. 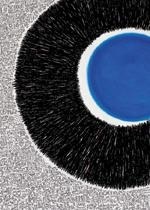 Asante's "Rejoice and Be Glad in It" (2008), a tissue paper ink monoprint, was exhibited in Rome in 2010. Work by Asante is included in the exhibition "Material Girls: Contemporary Black Women Artists" at the Reginald F. Lewis Museum of Maryland African American History & Culture, on view until October 16. (Download "Material Girls" brochure.) Earlier this year Asante showed at Morton Fine Art, in Washington, D.C., in "Stories That Breathe" (images here). Currently, Asante can be found during "open studio" days at the Bromo Seltzer Arts Tower, a landmark in Baltimore, Maryland, where she occupies the C. Sylvia and Eddie C. Brown Studio. 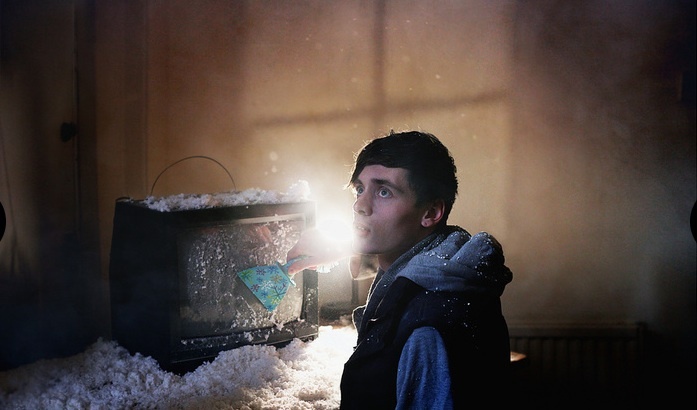 The studio is awarded at no cost to an emerging visual artist for two years. "Our Common Bond", Artist Talk at Galerie Myrtis Fine Art, November 15, 2009 (In this video, Asante speaks about her work in the exhibit.) Images from her Galerie Myrtis show are here. A series of other short videos, including the artist talk and the documentary, is here. London-based artist Keira Rathbone makes us all wish we'd never thrown out those old non-self-correcting typewriters from our college days. Not only does Rathbone use vintage be-ribboned machines to produce her images, including portraits and landscapes; she also has gone so far as to equip them with sound to create sonic installations. The owner of more than 30 typewriters, Rathbone sometimes spends as many as 90 hours to produce one of her inspired creations, some of which adorn wearables. Rathbone currently has a show at Upsy Daisy Bakery, Hammersmith, London, until September 2.
eager to measure the lifespan of fleeing birds. laid down before you and tell me your good night's dream. the silence in the too-tight space count every stone. that memory of stones, these reminders to forget. 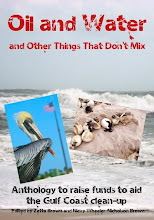 You won't find florid imagery in Carl Adamshick's Curses and Wishes (Louisiana State University Press, 2011), winner of the 2010 Walt Whitman Award sponsored by the Academy of American Poets. Adamshick is a poet who strips down language to spin his pictures in few words along short but barbed lines. she towed in her wagon. described ash in the treeline. ~ from "The book of Nelly Sachs"
you'll see we took your excrement. 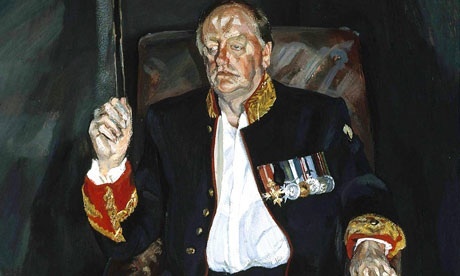 The poet's juxtapositions — "I didn't want to give my body to war. / I saw news footage of a fly // in a dead man's mouth." (from "The emptiness") or "She was saying she and her mother picked blackberries / in a morning fog the day she moved away, [. . .] // I told her I had never been to a funeral." (from "Pelican") or "I clear the chessboard of pieces // and find religion" (from "Fluency") — don't allow you to be a half-attentive reader. The poet doesn't shout, though; he disarms with his simplicity and economy of easily flowing language, so much so that you find yourself re-reading the poem you just too quickly finished. The poet's use of first- and familiar second-person voices gives the poems edge and immediacy, a "you are there" feeling that itself is a poetic hook. His effective use of enjambment leave his lines all the more pointed. The "curses" pronounced in this collection account not only for what we can see literally — "his body as insects / lived on the continent of his flesh, / lived until he was bone" (from "The emptiness") — but also for what our dreams and "university of memory" ("Arithmetic") feed us to haunt us — "your death / strung [...] as a jewel on a silver chain" (from "Benevolence"); "[...] that chain / we feel every time we walk" (from "War as the cherry blossoms"). 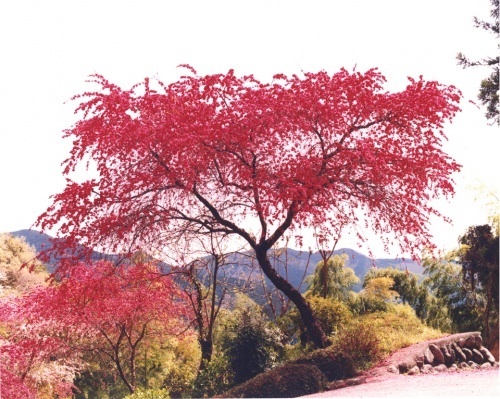 Fear, loss, death, grief, want, remembrance — all are here in Adamshick's poems. Being alive is the curse. The broken stile is covered in leaves. Adamshick's collection, his first book, numbers 27 poems. The final poem, "Out past the dead end sign", is the longest (13 pages), with its sections divided by a single, simple, initial-capped word: "And". It is a word giving full meaning to our need for connection. Adamshick has published a chapbook, Backscatter, and poems in such esteemed literary periodicals as Beloit Poetry Journal, Rhino, Mid-American Review, The Missouri Review, Ars Poetica, The Cortland Review, American Poet, and The Harvard Review. [. . .] is at the heart of poetry as healer. * John Fox, Poetic Medicine: The Healing Art of Poem-Making (New York: Putnam, 1997), p. 3. Fox also is the author of Finding What You Didn't Lose: Expressing Your Truth and Creativity Through Poem-Making (Tarcher, 1995). This edition introduces you to paper artist Elod Beregszazi, the design-craft site handful of salt, and the moving animation work of Freek van Haagen of the Netherlands. ✦ The nonprofit United Poets Laureate International is the parent organization of the World Congress of Poets. Every two years, a WCP is held during which poets from around the world present scholarly papers about poetry, bestow or receive poetry honors, and "come together in friendship and celebration" to hear one another's poems. The WCP site includes a "Poetry Corner". ✦ You'll find clips of video portraits of contemporary European artists at Artist on Film. Non-English-language films are subtitled. The site offers films on painters, water colorists, graphic artists, sculptors, and theatre artists and also features clips of videos on various artistic techniques. I find the site's clips a useful introduction to artists (primarily from Holland) not typically shown in the United States, and a take-off point for researching the work of those I find of particular interest. ✦ Check out Stanford Literary Lab for projects in digital and quantitative literary research. ✦ Modern design and contemporary fine craft are the focus of handful of salt, a wonderful site I discovered through my friend Nancie at MosaicArtNow (thank you, Nancie!). Be sure to look at the section with artist profiles. Broken from Freek van Haagen on Vimeo. Oil on Canvas, 88" x 54-1/2"
so she, taking his hint, dubbed him "The Brigadier". with the red cuffs, the bars of shimmery medals, the gold braids?" her last question for the day. He never speaks her name. Freud, grandson of Sigmund Freud, died Wednesday, age 88. This poem is offered in response to L.L. Barket's invitation "Let's Talk in Pictures" posted today at TweetSpeakPoetry and for Claire Burge's PhotoPlay challenge at The High Calling. In keeping with All Art Friday, I took a bit of license and used an image of an artwork as my prompt, imagining how "The Brigadier" might have responded to his out-of-sight interviewer. Anyone may participate in the challenge. Just be sure to post your offering by Wednesday, July 27, and then add your link in the comments section of L.L. 's post. ✦ This recent article in Wired Science, "The Cutting Edge Physics of Jackson Pollock", highlights fascinating research analyzing the physics, specifically fluid dynamics, in Pollock's art. In their study of Pollock's drip painting, the researchers even derived an equation for how the artist spread his paint. ✦ Work by Chuck Close, Jasper Johns, Raymond Pettibon, James Rosenquist, Cindy Sherman, and other well-known artists is slated to be auctioned by Christie's in New York City on September 22. Christie's has waived its commission fees, and 100 percent of the auction sales will be donated by Artists for Haiti to support nonprofit aid organizations serving Haitians still suffering from the effects of the devastating 2010 earthquake. A preview exhibition will be held at David Zwirner on September 6-10. The artworks also will be on view at Christie's (20 Rockefeller Plaza) September 17 - 20. ✦ David Zwirner's Second Annual Summer Pop-Up Bookstore is July 25 - August 5 at 533 West 19th Street, New York City. Rare and out-of-print books, signed artist catalogues, posters, and films are among the offerings. 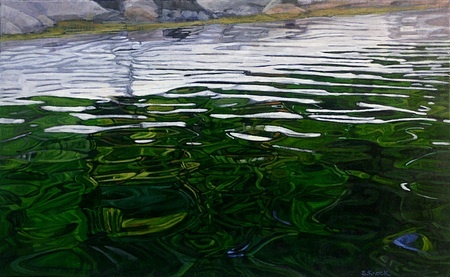 ✭ Maine's coast figures prominently in the beautifully shimmering paintings of Sarah Knock, a show of whose work opens August 4 at Greenhut Galleries in Portland, Maine. Knock's exhibition runs through August 27. 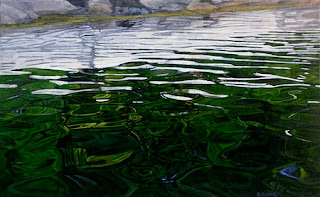 Knock's Just Water was selected for the Portland Museum of Art's 2011 Biennial. Her work was among that of 46 other artists so honored and selected from more than 900 entries. ✭ A retrospective of more than 200 paintings and drawings by LeConte Stewart (1891-1990) opened yesterday at Utah Museum of Fine Arts. The show, "Le Conte Stewart: Depression Era Art", is drawn from museum and private collections in the West and, according to the description, highlights the artist's examination of "thematic images of progress juxtaposed to the human consequences of economic upheaval". In a related exhibition that will be on view through January 16, 2012, Church History Museum, Salt Lake City, is presenting a survey of Stewart's landscapes on paper and paintings of rural Utah. For a video introduction to Stewart's art and rare footage of Stewart discussing his work, go here. ✭ In Richmond, Virginia, the Virginia Museum of Fine Arts opens "Modern Masters: New Paintings by Sean Scully and John Walker" on July 23. In addition to monumental paintings by the two artists, including Scully's Cut Ground Red Blue and Walker's North Branch II, both promised gifts to the museum, the show, which runs through November 27, features a suite of 12 photographs by Scully and four additional recent paintings by Walker. Image at Left: Sean Scully, Cut Ground Red Blue, 2009, Oil on Linen, 110" x 161-1/4", Promised Gift to Virginia Museum of Fine Arts by Pamela K. and William A. Royall Jr.
by Pamela K. and William A. Royall Jr.
✭ Continuing through August 28 at Pennsylvania Academy of the Fine Arts is "Hiro Sakaguchi: No Particular Place to Go", featuring drawings, paintings, and sculpture of the emerging artist. All out of Fourth of July sparklers? Perhaps this edition has a few scintillating facts to toss around during your summer barbecues. ✦ What do Margaret Mitchell, Albert Camus, Randall Jarrell, and David Halberstam have in common? Along with a number of other writers on this non-exhaustive list, they all came to untimely ends in motor vehicle accidents. ✦ "Columbo", starring the late Peter Falk (he died in June), was one of the three most popular segments of NBC's Mystery Movie series from the 1970s. The other two? "McCloud" and "McMillan and Wife". ✦ Publishing Perspectives, not wanting to give ground to Huffington Post's list of top 15 best-sellers of all time, came up with its own most-copies article. By its reckoning, among the top all-time 5 of the top 25 are Quotations from Chairman Mao, Chairman Mao's Poems, and Selected Articles of Mao Zedong (numbers 1, 3, and 5, respectively). Doing their own fact-checking, commenters on the Publishing Perspectives post took issue. It's too hot to argue; may we all just agree to disagree. ✦ Could your grill accommodate this? According to this UK BBQ site, in 1952 (notably, the year I was born), a fully grown crocodile that had consumed a springbok was cooked up on a 20-foot-long grill and served with a garnish of fresh mango. I've had alligator in Florida and kudu in South Africa. Do you suppose this might have tasted like chicken? ✦ According to the Hearth, Patio & Barbecue Association, 82 percent of all U.S. households owned a grill or smoker in 2009. This fact is not nearly so fun as the UK BBQ's (see above) but, grilling occasion aside, there are just not that many backyards, campsites, public parks, and tailgating venues here at home where you're likely to encounter crocodile. ✦ Inviting someone French to share a few smoked ribs before Labor Day? Be a good host and learn to say, de barbe a queue ("whiskers to tail"). ✦ Brisket will test your patience with the grill and send your guests to call one in from Dominos. Taken from a cow's chest, an eight-pound cut of this meat will take you some 12 hours to grill, says Backyard Barbecue. ✦ Haven't the faintest idea how to grill? There's an app for that: Grill-It. Poetry set to music can be sublime. Just listen to this composition by Eric Whitacre of "A Boy and a Girl" ("Los Novios") by the great Octavio Paz. A videotaped performance of the piece is here. and daubing a once-picture-perfect sky. protected in elemental but unspecified conditions. their curling edges left brittle to the touch. the quiet that always precedes the storm. I offer this poem for the final One Shot Wednesday event at One Stop Poetry, with my thanks to all, and to our host Pete especially, for pledging and fulfilling so great a commitment to creating a community around poetry. but once has known such sweetness. This poem is inspired by a prompt, Marie-Elizabeth Mali's "Second Year of Marriage" from Steady, My Gaze (Tebot Bach, 2011), in the most recent issue of poet Diane Lockward's newsletter. The instructions were to "[w]rite down the names of some sensuous food items, ones with fabulous aromas. Write down some other items with strong, distinctive smells. Let one or more of these trigger a memory. Go back to another time and place. Is there another person in your present scene or in the past scene? Let this be a love poem, though it doesn't have to be a romantic love poem. Now see how you might pull your material into a draft that shifts back and forth between past and present. Try just free-writing at first. Give yourself 10 minutes. Shape your material into a poem, maybe eventually using two-line stanzas as Marie-Elizabeth has." 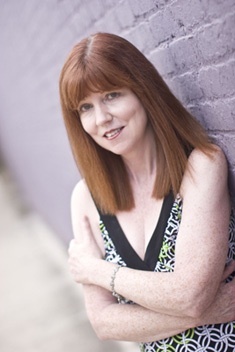 Julie Kane officially became Louisiana's eleventh Poet Laureate on May 23, succeeding Darrell Bourque, profiled here in January. Details about the position, as well as state-specific poetry resources, are found in my earlier post. During her two-year term (2011-2013), Kane will deliver an annual poetry reading, the position's only requirement, and travel the state to promote poetry. Poet Julie Kane, Ph.D., a Louisiana resident for more than three decades, is the author, most recently, of Jazz Funeral (Story Line Press, 2009), a collection of sonnets awarded the 2009 Donald Justice Poetry Prize; and Rhythm & Booze (University of Illinois Press, 2003), selected for the National Poetry Series and a finalist for a 2005 Poets' Prize. (It mostly comprises villanelles.) Her early publications include the chapbook The Bartender Poems (Greville Press, 1991), the chapbook Two Into One (Only Poetry Press, 1982), half of which comprised the work of poet Ruth Adatia, and Body and Soul** (Pirogue Publishing, 1987). Her fourth collection, No-Win Situations, comprising light verse, is in progress. Kane, associate editor of the Pearson-Longman Southern literature anthology, also is a nonfiction writer, essayist, and translator. She co-wrote, with Kiem Do, Counterpart: A South Vietnamese Naval Officer's War (Naval Institute Press, 1998), which was showcased by History Book Club in 1999. With Grace Bauer, she co-edited the anthology Umpteen Ways of Looking at a Possum: Critical and Creative Responses to Evverette Maddox (Xavier Review Press, 2006; audio here), a finalist for a 2007 book award in poetry from the Southern Independent Booksellers Alliance. In an essay about judging contemporary sonnets, Kane wrote that she dislikes "[a]rchaic language, predictable rhymes, wrenched syntax, forced sentimentality, dullness" and favors "wit, wordplay, thought, craft, subtlety of sound effects, awareness of the past, attention to the present and the world we live in, originality, flair. "*** Kane's admirers, while noting the absence of the former from her poetry, would be quick to point to the latter as being fully in evidence. Kane works hard, she says in interviews, to craft "accessible" poetry. Indeed, her skillful, beautifully crafted formal poems display, as does her free verse, a sense of humor and a talent for using a colloquial voice. its publication by a London press. The man I thought would love me till I died. I had a rush on from afar. the summer we kissed across the bar. Balancing on the rail was hard. Spilled beer made my elbows stick. the movie screen, a movie star. Drinks stayed empty. Ashtrays tarred. Summer went by like a shooting star. The recipient of a Fulbright scholarship (2002), Kane also has been awarded an Academy of American Poets prize, a Glenna Luschei Prairie Schooner poetry award, and an Open Poetry Ltd. Sonnet Prize. She also has been nominated for a Pushcart Prize. Her poems have appeared in dozens of journals, including The Antioch Review, Prairie Schooner, The Formalist, The Southern Review, and Verse Daily, as well as in Poetry: A Pocket Anthology (5th Ed., Penguin, 2006), Voices of the American South (Pearson/Longman, 2004), and more than two dozen other anthologies. Kane, professor of English in the Department of Language & Communication at Northwestern State University of Louisiana in Natchitoches, teaches creative writing and American poetry. She has been a George Bennett Fellow in Writing at Phillips Exeter Academy (the first woman so honored) and has twice held a New Orleans Writer-in-Residence at Tulane University. ** This was Kane's first full-length poetry collection. Although out of print, it is available on Kindle. *** While an undergraduate, Kane studied with A.R. Ammons, William Matthews, and Robert Morgan. She was briefly a graduate poetry student of Anne Sexton. Her doctoral dissertation is on the villanelle and its transition from musical genre to fixed poetic form. Kane is described as a practitioner of "New Formalism". This poem is offered for the final One Shoot Sunday event at One Stop Poetry, which today features Chris Galford's interview with photographer Rosie Hardy and features a number of Hardy's images, including the one above. I also offer my appreciation to Pete, Adam, Brian, Chris, Claudia, Gay, and Leslie, who for more than a year have given many devoted hours to creating a place for poets, photographers, and anyone who enjoys the arts to gather and share their talents. Anyone may participate in today's poetry challenge. Go here to read the interview and then scroll to the end of the page for instructions for linking your contribution to those of the rest of the One Stop community. and freedom, safety plus danger. Today's new edition of Saturday Sharing has something for every kind of visual artist and literary type. You techies also will find at least two features of interest. ✦ Are you a poet or writer looking for inspiration? Be sure to check out Creative Writing Prompts for Writers. The site accepts submissions of visual art to serve as prompts. ✦ If you're the kind of person who can never get enough Lewis Carroll, you'll enjoy visiting the site for Everything Alice: The Wonderland Book of Makes. It's more than a craft and cookery book by Hannah Read-Baldrey and Christine Leech. ✦ Use Recollection when you want to create and customize interactive maps, timelines, and tag clouds, or otherwise "experience" digital collections. The software platform draws on Web-based open standards and open-source tools that make it possible to collect and explore diverse collections of data. ✦ Founded in 2008, the Web journal TheStudioVisit introduces professional artists at work in their studios to communities of other artists, curators, writers, and supporters of visual arts. Its objective is to show and de-mystify the technical and intellectual processes of contemporary art-making, in all media, by going into artists' studios and discussing the artists' ideas, critiquing, and filming demonstrations. Contributors have visited artists in the District of Columbia and the states of Georgia, Maryland, Michigan, North Carolina, Oregon, South Carolina, Virginia, and Washington; and Latin America. TSV's "chief collaborator" is mixed-media artist, curator, and educator Isabel Manalo. ✦ Few people would admit to not being able to find anything to read; however, if you count yourself in that group, check out Byliner, which publishes in digital form original articles of 10,000 to 35,000 words. The articles range over culture, technology, politics, business, science, crime, adventure, sports, and just about any other subject of writing. The site also serves as social media function by connecting writers directly with their audiences. Writers with more than 10 Byliner-featured articles become candidates for writer directory pages. Earlier this week the National Endowment for the Arts and the Knight Foundation launched the Knight/NEA Community Arts Journalism Challenge. The pilot competition, for projects in eight cities (Akron, Ohio; Detroit, Michigan; Macon, Georgia; Charlotte, North Carolina; Miami, Flordia; Philadelphia, Pennsylvania; San Jose/Silicon Valley, California; St. Paul, Minnesota), is seeking new models to cover community arts and produce quality cultural criticism. The competition will accept until August 18 applications from individuals, nonprofits, and businesses. Up to $100,000 per project is available ($20,000 to develop an idea and up to $80,000 for second-round implementation). Go here for more information and application materials. Today's spotlight is on London-based artist Cornelia Parker and her creation of Folkestone Mermaid for this year's Folkestone Triennial in the United Kingdom. Parker's bronze sculpture is based on a living person, a 38-year-old mother of two. ✭ Britain's Tate Modern is presenting "Cy Twombly: Cycles and Seasons:" through September 14. Including sculpture and paintings by Virginia-born Twombly (1928 - 2011), the exhibition is spread over 12 rooms at the museum, each giving emphasis to Twombly's influences, growth, and development as one of the world's great artists. Sample audio from the audioguide for the show is here. 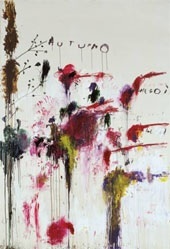 Essay, "Lingering at the Threshold: Claire Daigle on Cy Twombly"
Podcast and Transcript: Patricia Smith, Tate conservator of modern and contemporary paintings, on Quattro Stagioni. ✭ Preston Contemporary Art Center, Mesilla, New Mexico (south of Las Cruces), is showing through August 27 the visually stunning and complex quilts of textile artist Dan Olfe. Internationally exhibited, the California-based Olfe, who took up quilt-making in 1997, first creates his geometic and abstract designs on a computer and then directly prints them on cloth before quilting. He uses a Japanese sewing machine. ✭ In Washington, D.C., Corcoran Gallery of Art offers through August 14 "Washington Color and Light", featuring work by artists associated with the Washington Color School and their contemporaries. 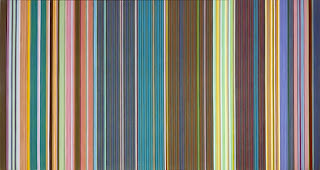 Highlighting work from the 1950s through late 1970s, the exhibition includes monumental stripe paintings of Gene Davis, as well as paintings by Thomas Downing, Howard Mehring, Kenneth Noland, Paul Reed, the much-loved Sam Gilliam, and Alma Thomas. Also on show: sculpture by Rockne Krebs, Ed McGowin, and Anne Truitt. 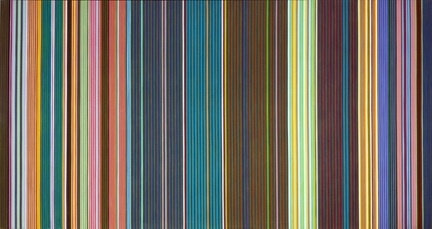 Acrylic on Canvas, 115-5/8" x 219-1/8"
The Corcoran also is showing a digital projection (see image below) by Charles Sandison, an installation in which computer-generated color-coded words are used to express emotions, states of being, and patterns of human behavior. ✭ At The Athenaeum, Alexandria, Virginia, you'll find "Drawing Analogies", featuring Victor Ekpuk's works on paper, inspired by Nsibidi, an ancient African system of writing using graphic signs and codes; Mindy Hirt's installation using a window frame for a drawing in space with string; Sarah Laing's compositions of ink and spray paint on Mylar; Beverly Ress's drawings; Fiona Ross's works in Sumi ink of Japanese rice paper; Renee van der Stelt's drawings in graphite on paper, based on cartographic diagrams of the globe and natural phenomena; and Alice Whealin's ink works on acetate. The show runs through August 28. An artist's reception will be held this coming Sunday, July 17, from 4:00 p.m. to 6:00 p.m. Pastel and Graphite on Paper, 50" x 50"
✭ The Workhouse Arts Center, Lorton, Virginia, continues through July 31 its curated military art exhibition "Arts & Stripes". The show includes artwork of members of the Combat Paper Project, which I wrote about here in 2009.